On 17th May 2006, the week before my 27th Birthday I had a bone density scan performed at the place I used to work. I'd heard I could get a special corporate deal - they're usually rather expensive - and I was quite worried because of the osteoporosis risk present in my family history. My own Gran had really bad osteoarthritis and I was concerned about my own bones - particularly because I knew that my diet was poor as I was still in the grips of my various eating disorders and I was worried about the effects this had on my body. I'm not going to lie and say that *immediately* after that reading was taken I turned my life around and started exercising and eating properly because that's simply not true, it's taken a good few years to turn my life around. I *had* started running at the point, and completed a triathlon, but I was still bulimic and I was drinking excessively. However, 2007-2008 saw me in a happier place where I began a relationship with Joe and gradually started to claw back control over my eating - what went in, and what stayed down. Last year I decided to enter the Maxitone (then Maximuscle) Body of 2009 competition and started this blog to help me record my efforts and keep me motivated. I rediscovered my love of weight training (the last time before this that I'd picked up any weights was when I was 19/20!!) and found focus and also, unexpectedly, support through the people who read and comment on my blog! I can't even begin to describe how beneficial this blog has been in my recovery. Although I'd managed to conquer my bulimia before I started keeping my online diary, and I'd really like to think that I wouldn't ever have gone back to that dark place again - I know that this has kept me strong and it serves as a daily reminder of how far I've come and just how different a person I am to that miserable, scared, selfish, helpless woman who almost destroyed her body. I can safely say that I will NEVER go back to that again, not now I've experience how good it is to look and feel strong. I have learnt so much over the past year as a result of reading other people's blogs, and health articles, fitness and muscle magazines. I never thought I'd find a way of eating which was healthy and suited me down to the ground. I especially never thought that this would be a bodybuilder's diet!! It's true though, the amount of money that is invested on research into how different foods and nutrients interact with, and improve your body, its functionality and performance is amazing! I'm pretty sure that no other diet organisations/plans/food manufacturers invest so heavily in science-driven proof! Anyway, what I'm saying is that I've finally reached an equilibrium between the food that goes in and the way I feel about my body. My desire to feed it, fuel it, keep it running at full strength and capacity for as long as possible has finally conquered all other thoughts of reaching an impossibly slim size. Although I don't run as often as I'd like to because of long-term injury, I do a lot of dumbbell - as well as bodyweight - training as well as more aerobic high-impact classes (like Boxercise, Zumba etc...) and I walk a lot as well. I also do spinning classes and cycle too but it's important to note that these do not have any effect on bone strengthening, neither does swimming, rowing, or any other exercise where your bodyweight is supported. That doesn't mean you shouldn't do them as they are hugely beneficial to your cardiovascular health, just that you should incorporate some impact and resistance training in there too. Basically, any exercise which results in impact will stimulate bone growth. I also take a Boots effervescent Calcium and Vitamins D & K supplement - EVERY day! I dissolve it in a large glass and add a teaspoonful or two of Fibresure too to help keep up my fibre intake. 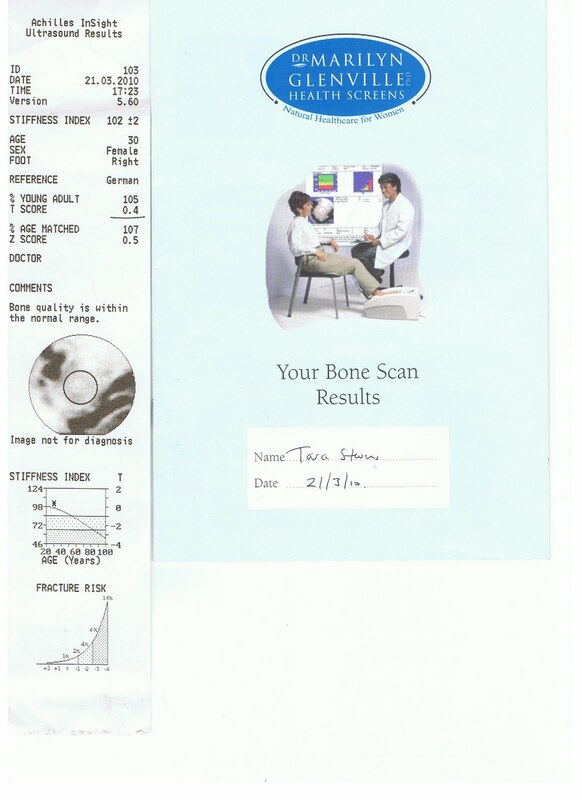 I now have *above* average bone density instead of below! To say that I am thrilled by these results would be the ultimate in understatements!! Awesome! I think that deserves major kudos. I have read about it but never met anyone who actually got tested and realized the results of weight training in this aspect. You rock, hot mama! Keep pushing forward! Hey tara, im a friend of Lucie Anslow. She told me you are doing Fame this year, im also competing in fitness model on saturday and sunday. Im a trainer in covent Graden and Mayfair, so ill be in London every day if you want to get in touch, im gonna be practicing posing and routines every day now. Holy Mother of all Blog Updates, Batman! FAME Update - 8 weeks out!